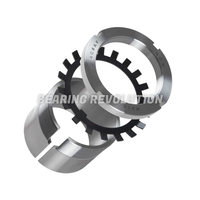 Bearing Revolution have a large stockholding of adaptor sleeves, we stock all popular and hard to find adapter sleeves in our stock range of over 12.5 million bearing related products. An adaptor sleeves ultimate purpose is to sit in a tapered bore to be located on cylindrical shaft. They are easy to install and require no additional location on the shaft. Locknuts can be used to fix bearings on shafts or adaptor sleeves. Adaptor sleeves typically sit within a bore tapered 1:12 but can be available in the H240 and H241 series where they are tapered 1:30. Adaptor sleeves are available in metric in the main but imperial sizes can also be found here at Bearing Revolution. The Bearing Revolution team understand that there is wide choice of adapter sleeves and choosing the wrong one can take up precious time, so if you are unsure on which product to purchase you can call us on 01952 222100 and we would be glad to help guiding you to purchase the correct adapter sleeve. You can find adaptor sleeves in our stocks in Premium, Budget and our very own Select range.